You are all prepared to kick start your business idea and turn your dream into reality. Everything has been organized and taken care of – you have the business plan ready, the product/service you are going to offer is going through the final stages of market research & development, and you have all the investors ready to pay you for initiating the business. But there is one more thing that you need to do and make a huge decision about – where do you want to incorporate your business? Does your target demographic live in the area you have selected? How is the competition in your area and is it too steep? What kind of local support is there for the businesses that are growing in the area? As you answer these questions after researching about the states in the USA that would be the best choice for you to start your business in, you would get one answer – Nevada. In the past, this place was known for its casinos, cacti, and desert. This state has now made a name for itself as a place that offers many opportunities to people. One of the basic things that people worry about is the cost of living in a place, especially in a developed country like the USA. But when we talk about Nevada, the cost of living here is much more reasonable as compared to all the other parts of the country. Las Vegas has been noted as the city that has the lowest cost of living on the national average. And due to this, it has always attracted many professionals from all over the country to come and open their business there. Companies are looking for the best employees all over the country, and the competition is high. With your company in Nevada, you would be able to get the top talent and have a leg up in the competition. This is because the employees would find it easier to shift and live in a place where the cost of living is low. Another great thing about Nevada is the taxation environment here. This state is one of the best places to run a business without worrying a lot about taxation in the state. To make this clearer, the LLCs do not have any franchise tax, there are no personal income taxes levied on anyone in the state, and the shareholders and business owners do not have to be a local resident to open a business in the state. Moreover, Nevada has worked towards incentivizing the tax code making it easier for the people to understand. Other than this, there are a lot of tax reductions that everyone can enjoy in the state of Nevada. These two reasons are the main ones that make Nevada the home to many kinds of companies. This basically puts up a wonderful stage for a large boom in employment. All-in-all, to begin your business, you need to choose the right place that you would be able to call your business home, and Nevada may be your only best bet. Now that you know where you need to begin your business and why is it this way, there is no reason to get scared of leaving your job and starting your own business. Just to be clear, not all business ideas work for every place and starting in Nevada means picking up those ideas that would make you succeed for sure. 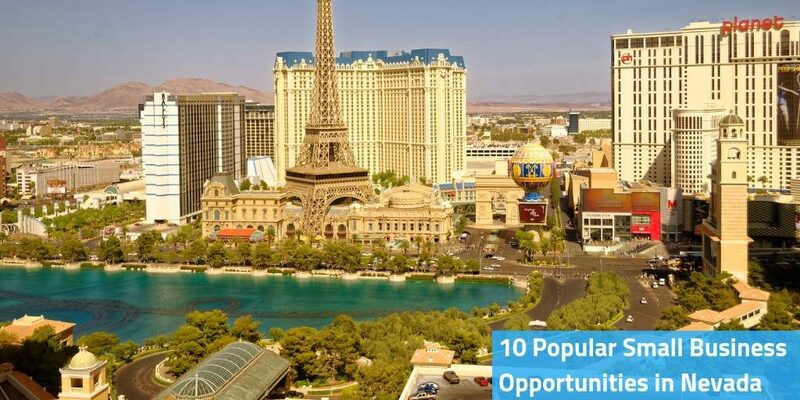 And so, to help you with it, here are the top 10 exceptional Nevada business opportunities that you can consider. As a matter of fact, these ideas are so simple that you might just need a little capital or no capital to start it. One business that you can consider is the one that involves the manufacturing of children toys. Every child loves toys. Toys are not just bought during festivals or celebrations, but they are bought anytime to make children happy. If you have ever paid attention, you would have noticed that toy stores are always filled with people buying toys or children crying to have a toy bought for them. From this, it is seen that toys are bought a lot and having a business of selling toys is the best thing. And during the festival time, you can be sure to have all your stocks sold out. Moreover, creating toys is very easy since they can be made with any material from plastic, woods, and even the cloth materials. Furthermore, the market for the toys is widespread where you can sell them anywhere in Nevada or even export it outside the state and country. If you are looking for something simpler, you can try out dressmaking. Starting a brand in clothing or a cloth line is very easy these days and it is something that you can consider to do. But in case you do not have the amount of capital needed for this, then you can move to a smaller scale idea under dressmaking which includes cloth mending services, washing services, uniform production services, and even the sales of sewing materials and fabrics. Amongst the list of easy to start Nevada business opportunities, pet walking is the easiest one, mostly for those who love pets a lot. It is not easy for people to give time to their pets from their busy schedules. But not giving the pets any time would make their pets restless and devoid of any physical exercise which is not a good thing. That is why many people tend to look for pet walker who can take care of their pets when they are away from home. This is a paid service and you can make a business out of it. Many companies usually look for social media consultancy and if you begin to offer the social media consultancy services, it can help both you and them. Social media consultancy means offering people help with managing their social media accounts. The consultant usually helps to bring in traffic to the accounts that would assist in generating much more revenue for the business. If you are a person who loves art and craft, then jewelry making can be your thing. Even girl loves to wear jewelry and these days even men are wearing a lot of jewelry. So, if creativity is your thing, you can begin making jewelry and selling them. You do not have to restrict yourself to selling jewelry in the same state. You can also sell the pieces online on platforms like Amazon, Ebay, and other e-commerce platforms. As a matter of fact, there are many kinds of jewelry making that you can get into. There is bead making, bridal jewelry making, children jewelry and a lot more. Another one of the Nevada business opportunities is the furniture making business. You can begin making furniture that can be supplied to various people around the city and even the state. The furniture can be for private individuals, corporate establishments or even for the schools. Another thing you can consider to do is become a government contractor. Lots of government establishments need furniture and by connecting with them, you would be able to get a consistent source for income as you supply furniture to the government. Do you love being fit and healthy? Can you help others do the same? Well then, you can become a personal fitness trainer. Many people do not like to go to the gym every day. Some prefer to stay at home and have a fitness trainer help them achieve their fitness goals. You can be the trainer and earn a lot by it as well. If you don’t like the Nevada business opportunities shared above, and you would rather cook food for people, then you can become a dinner preparer. In this business, you would just have to cook homemade and tasty dishes that can then be sold to people who live away from their homes or anyone who needs it. This business can be in the form of a subscription service, where a person can subscribe to have food delivered on a daily basis at a specific time. Another idea is to create a model for the service where you can make pre-packaged meals that supply them to the grocery stores and supermarkets. This would help you earn a lot and would also be fun to do if you are a person who loves cooking. You can also start a bed and breakfast business if you have a property in Nevada. In this business, you would need to offer people with accommodation for the little time that they are staying in the locality. But having a home in Nevada is important for this business. And if you have a home, you can use a part of it to start the business. For this, you wouldn’t need to spend a lot of money then. Once you begin the business, you can then slowly grow it and expand by purchasing more properties when the money comes in. The last one of the best Nevada business opportunities that you can choose from is babysitting. This business requires no capital at all, and you can do it easily without taking much stress. In short, you can go and help parents take care of their children and in return get paid for it. Many parents work for long hours and need someone to take care of their children. You can do this and handle it single-handedly. Now that you know the state that you want to start your business in and have some great Nevada business opportunities shared above, you can move ahead to have your business plan prepared. Once you are ready, you would need to register your business with the Nevada government. For this, IncParadise can help you. Our representatives can help you in having your company registered and incorporated in Nevada at a reasonable price. Moreover, IncParadise also assists in many other services that you would need for setting up your business like getting the needed licenses from the government, virtual office services, mail forwarding services, and so on. And once your company has been created, you can do the right thing being an entrepreneur and keeping track of all the shares in the company, For this, you can use the cap table application – Eqvista which is a free application to track and manage your company shares.